With kids going back to school and autumn upon us, we need to start preparing for the spookiest holiday of the year: Halloween! Halloween is a time for both kids and adults to dress up as their favorite characters. Whether trick-or-treating for candy (or perhaps for the adults, a ghoulish drink) we have costume ideas for everyone. Costumes can be a breeze using temporary tattoos, and we’ve got you covered with the trendiest costumes this season. Don’t forget to grab some of our Halloween temporary tattoos for trick-or-treaters too! Support the Teal Pumpkin Project by handing out temporary tattoos instead of candy to raise awareness of food allergies and promote inclusion of all trick-or-treaters. Unicorns are definitely real with this temporary tattoo! For those that want to get creative this Halloween, a unicorn costume is the one for you! Must need necessities for this costume include: a tutu, unicorn horn, and of course, glitter! For a quick tutorial on how to make your own tutu (no sew!) WikiHow has you set with three different methods. The best part about this costume is that there are many ways to make this costume unique to you. If you need some extra inspiration on how much glitter and color to add to your unicorn costume, Seventeen has provided 10 DIY Unicorn Costumes you can replicate yourself. 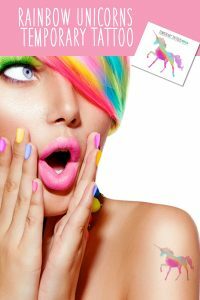 Give yourself some extra flare with our unicorn temporary tattoos. Add some metallic freckles to your costume that way you are not worrying about your makeup coming off because we know how long the perfect look takes to master. If you’re wanting to up the fear factor this Halloween then look no further than a clown costume. As we are anxiously waiting for Stephen King’s It 2 to come to theaters next year, a clown costume is totally trending as we see different versions of Pennywise terrorizing storm drains in the streets. For some inspiration to help you decide if you want to be a good clown or a bad clown Pinterest has clown costume ideas that range from cute to spooky. Aside from the red nose, a key part to this costume is making sure your face looks like a real clown. Our clown temporary tattoo, is the candle to your Jack-O-Lantern for inspiration to completing your costume without the hassle of painting your face in makeup or messy face paint. Always be yourself… but if you can be a mermaid always be a mermaid! One of the trendiest costume ideas for this Halloween is dressing as a mermaid! With their flowy hair, sequin tails, and seashell tops this costume is perfect for those that love to DIY. Lauren Conrad, actress from The Hills, has created her own version of a mermaid costume that is easy and totally Instagram-worthy. Lauren Conrad’s tutorial gives you the opportunity to add some creativity to this costume by accessorizing your seashell top to your liking, and adding colorful tulle to make your mermaid tail pop. Pinterest also has a fabulous set of ideas to help inspire you with makeup ideas, other costume tutorials, and more. If you do not want to worry about the hassle of drawing on your own mermaid scales with tons of paint or makeup we have the perfect metallic mermaid temporary tattoo that is meant to complete this look with ease. 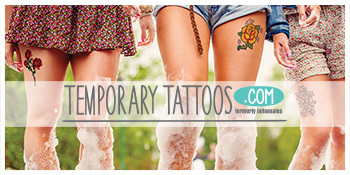 Also add some cute ocean themed temporary tattoos for a more realistic look, such as our Multicolor Seahorse. Go mess-free this Halloween by decorating your pumpkin with temporary tattoos! If you or your kids are not into dressing up in a Halloween costume this year, then make sure to dress up your pumpkins! 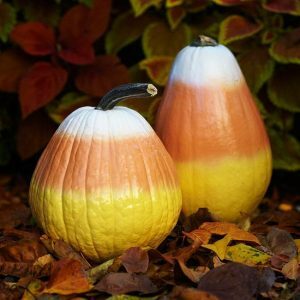 There are different ways to create a Jack-O-Lantern, and Pinterest has you covered with 189 ways to decorate your pumpkin. While many find the “goop” from the inside of your pumpkin to be repulsive, others clean the seeds and bake them for a healthy treat. The Food Networkgives you an easy how-to along with what spices to use for your pumpkin seeds. If you don’t feel like carving a pumpkin at all this holiday season then we have the perfect plan for you to still celebrate that Halloween spirit. Try out some of our Jack-O-Lantern pumpkin décor for a pumpkin that looks like you put the extra effort in. You could also pick a theme of temporary tattoos for your pumpkin from scary spiders to our entire collection of Halloween themed tattoos. Have a FANG-tastic Halloween and remember to tag @temporary.tattoos in your finished costumes on social media!